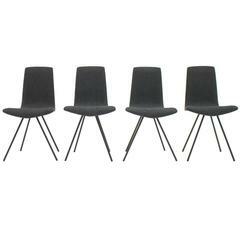 A large set of 60 dining room chairs SE 121 by architect Egon Eiermann, 1964. The chairs are made of beechwood and stained in oak. Each chair has a seat and back cushions with black faux leather. The chairs are from 1965. We have in total 60 chairs in stock. Price is per item. Every chair is in a very good condition. Set of four dining room chairs in wicker and metal, Germany, 1960s. Good condition with small signs of usage. Nice pair of side chairs by Kai Lyngfeldt-Larsen for Søren Willadsen. Very good condition with original fabric. Great set of four Model SE 68 dining chairs by Egon Eiermann for Wilde & Spieth, tubular, chrome-plated steel with painted black wooden, ergonomically formed seats, marked. Egon Eiermann single chair manufactured by Wilde & Spieth in Germany in the 1950s. Original red painted reed and robust iron frame. In good condition.